Darina, 54, from Brighton volunteers with LifeLines, a project aimed at supporting people over 50 through volunteer-led group activities or 1:1 services. “I used to take a woman I was befriending, Pat, to the art class at Patching Lodge. We attended together for two years but Pat has dementia and moved into a nursing home about a year ago. I decided to continue attending the classes because Margaret, the teacher, is wonderful. Whatever the project, she manages to incorporate every level of ability. It’s not solely about technique; it’s about looking and really seeing. Margaret directs without being too prescriptive and adapts activities to suit everyone. Lifelines is a really cohesive group. We often have a coffee after the class and have been to exhibitions together in Brighton and London. I also volunteer at a dance awareness workshop and meet an elderly woman once a fortnight to take her out. There are all kinds of difficulties that people experience as they get older and it’s really increased my own sense of age. I want to ensure that I’m engaged with things that keep me curious and interested. I’ve seen the effects when people don’t do that. Although I work 3 days a week as a property lawyer, I make time to volunteer when I can. 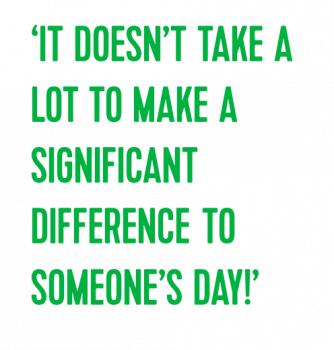 I think some people have a misconception about volunteering – that if they start they’ll get sucked into something bigger – but it doesn’t take a lot to make a significant difference to someone’s day!